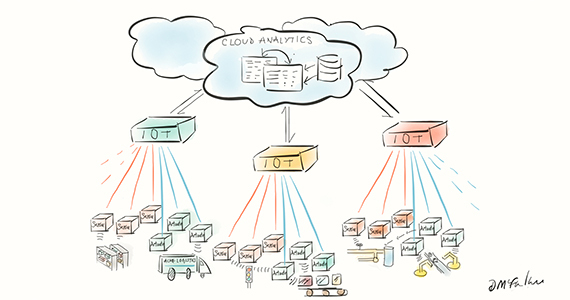 What's next for the IoT? Head of the IfM's Distributed Information and Automation Laboratory (DIAL), Professor Duncan McFarlane, is a pioneer of the internet of things (IoT) and was part of the research team that coined the term "internet of things" 20 years ago. Today he and his research team are working with multinational companies to help transform their processes and supply chains by extending IoT technologies to the industrial IoT (IIoT). Professor McFarlane will discuss the opportunities and obstacles that he sees for manufacturers as we head towards the Industrial IoT in a free webinar on 23 November 2017. He says that the IoT brings many additional challenges for manufacturers, which have widely distributed supply chains, multiple suppliers and mature IT systems, but that there are ways to work around these barriers and catch the next wave of IoT developments. Since the term IoT was invented, the focus has been on collecting sensing data. Professor McFarlane says that the first evolution of the IoT concentrated on developing technolgies to collect data from objects and then transmit that information to a central spot (the cloud). He says that the next stage in the IoT evolution will be about exploiting sensing developments – including super-low-energy, long-distance and long-lasting sensors – to securely share data between different organisations and to use the data collected to automatically trigger actions, such a self-repairing pipes in remote locations. What types of IoT data do manufacturers need? This webinar was recorded in November 2017.